Indian sandalwood (Santalum album) is a medium-sized evergreen semi root parasitic tree. It is a commercially important species for its heartwood essential oil, extensively used in medicines, cosmetics, perfume and incense industry. Sandalwood harvesting usually involves removal of the entire tree resulting in critical loss of the genetic diversity.Commercial plantation of the species is not widely done due to nonavailability of good quality planting material in sufficient quantity. Production of sandalwood plantlets through vegetative propagation in regular nurseries is also difficult and time-consuming. Hence, there is a need to develop such planting material/plantlets through tissue culture technique,which provide high yielding clones of candidate plus trees of sandalwood. 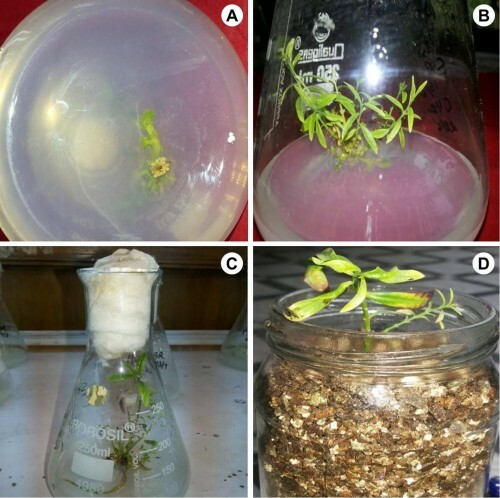 In the present study, an efficient plant regeneration protocol for in vitro propagation of Santalum album has been developed. Plant propagation using nodal explants was achieved on Murashige and Skoog’s (MS) medium. MS solution contains a mixture of macroelement like NH4, KNO3, Mg, Ca, KH2 and microelements like Zn, H3BO4, MnSo4, Cu and Co, sucrose as a source of carbohydrate and vitamins. Effect of plant growth regulators (PGR) like 6-Benzylaminopurine (BAP) and Kinetin (Kn) on shoot induction and multiplication and Indole-3 Butyric acid (IBA) and Naphthalene Acetic acid (NAA) on rooting was studied. Highest shoot multiplication with longest shootlets (2.90 cm) was achieved on MS medium containing 0.5 mg L-1 BAP and 5.0 ml L-1 IBA after 30 days of culture. New shoots were repeatedly harvested up to three subculture passages on the fresh medium of same concentration at 4-week intervals. Microshoots treated with 50.0 ml L-1 IBA for 48 h produced roots on growth regulator free, half-strength MS medium followed by one-week incubation in the dark. Hence, this protocol is a simple, rapid and highly reproducible to obtain more number of quality plants of Santalum album within a short period. Fig. : Santalum album L.: A, In vitro rooting of pulse treated shoots after 8 weeks; B, In vitro rooted microshoots; C, Elongation of in vitro root and shoot; D, In vitro microshoots in soilrite.